Today was another wonderful science class. We had been thinking of water travelling up, and had seen Al Jazari’s machine and Archimedes’ screw. Today we actually made water travel up! We took a large beaker and added 100 ml of water to it. Then Aunty put in a rolled hanky, a rolled piece of newspaper, a cotton string and a bunch of cotton swabs which she rolled into a long rope. In another beaker, she added a rolled piece of white towel. Then she took a white bowl and added diluted blue paint. She made a piece of yellow chalk stand in the middle. She asked us to sit back and observe the containers. Safwaan noted the start time. We put the cloth/newspaper/string in at 10:36. And the chalk in the paint at 10:38. Almost at once we started seeing the rolled newspaper getting wet above the water line. Water was climbing! After half an hour, Aunty asked us to feel the towel — it was wet on the part outside the container rim. So was the newspaper. The hanky was wet at the rim. The string and the cotton wool didn’t get wet even a little inside the rim of the beaker. We were surprised and wondered why the string and cotton wool did not get wet. It was a regular cotton string with no coating that we could see. And the cotton wool was advertised as “absorbent”. It seems that different products that we call “pure cotton” are manufactured using different processes which give them the properties that we want. It would be inconvenient if cotton wool was so absorbent it soaked up all the medicine, leaving little to go into our wound. Then we saw the water climbing in the chalk. But not the paint. By 10:48, the water had climbed to the halfway point on the chalk. The paint was climbing too but very slowly. Rafia Aunty said, we should see if the same thing happens with ink. She ran to the store and bought a bottle of ink. We poured ink into a container and put another piece of yellow chalk into it. This was at 10:56. We saw the ink climbing fast — much faster than the paint. But when it reached the halfway point, it slowed down. And a small difference of levels appeared — there was a water line just a little above the blue ink line – but they both climbed the chalk. The water reached the top after 36 minutes. Finally the ink / water combination was slower than the water line in the paint. We were surprised — because initially the ink was climbing much faster than the paint. In fact it had reached the halfway point in just 10 minutes. Then Aunty asked Abdullah and Ameeth to go get lots of sand in a container. She poured 200 ml of water into a beaker. Then using a spade, she started adding sand into that container. Wow! Water just kept rushing up and making the top of each spade-ful wet. But after a few spades-fuls, the water level didn’t climb as fast. 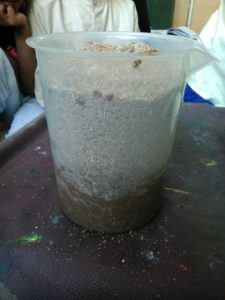 When she had filled the container, we noticed there were 3 levels — on the top there was a layer of dry sand. Then there was a damp layer. Below that there was a wet layer. We thought it would stop there. But when we saw the beaker an hour later, the damp water level was very high. Aunty told us this happens under the ground also. Water travels up through the sand. 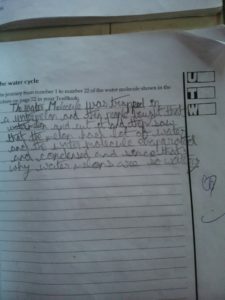 Water climbed the paper the fastest. Then the hanky. It climbed the string slowly. It climbed the cotton balls very slowly. The water climbed the towel very fast. The water separated from the paint and climbed fast. Water level in the bowl shrank — leaving a blue line on the chalk at the original level of paint. The paint which climbed looked green. After 33 minutes the water had reached the top of the chalk. Very little paint seemed to have climbed. The water top level was smooth not jagged. After the water had climbed to the top, we think we saw the chalk breaking up. First water and ink climbed together. After some time, the water separated and climbed just a little higher than the ink. The colours of the ink also separated. At the top, it was colourless (water), then a little below the ink was light blue. Lower down it was dark blue. The top line was jagged. Water climbed to the top in 36 minutes. Water climbed very fast initially. Then three levels of sand appeared — dry on top, damp in the middle and wet at the bottom. Then the speed of water climbing slowed down. Ishal asked why is it that when water can travel up and down sand that all the sea water doesn’t sink below the seabed. Aunty explained that there was a lot of water in the sea compared to the sand at the bottom. And below the sand was a layer of rock — as there was under the land too. Somebody else asked what the water temperature was when we started. Aunty said it was room temperature. I wonder if it will make a difference to the rate of climbing if we use cold or hot water? Rayya said she would like to do the experiment using muddy water. Will the mud also climb the towel? She did it at home and made a video for us. The mud didn’t climb and she got cleaner water in the second container. Today we learned about evaporation. First Aunty wiped the blackboard with a wet cloth. It left dark wet marks and some water even started dripping down. Then she smeared some of the wet portion with her fingers. She asked us to observe and state what happens. We saw that the water she had smeared dried faster. She asked us why the water was drying. Safwan said that her act of smearing made the water “shallower”. So, it could dry faster. Abdullah said the fans helped all the water dry on the blackboard. Mariam said the sun was out so the water was drying. Aunty asked if there was any sunlight in the room to dry the water. “But the lights are on. And they give light which dries the water”, said Mariam. Safwan said that the sun is millions of degrees hot so it can dry the water. Aunty remarked that the “millions of degrees” isn’t here on the earth but yes, it’s the sun’s radiation that heats the earth. We discussed how wind and heat from the sun help things dry faster — making the water level shallow. 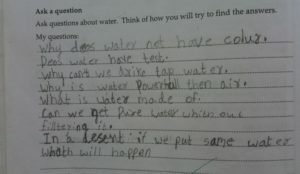 Aunty asked us what happens to water when it evaporates. We knew that — it becomes water vapour. We also know that water boils at 100 degrees. At first we were puzzled why water starts evaporating even when it is cold. It’s because there are always a few fast moving molecules which take off from its surface. The wind carries these molecules away, so then some more escape from the water. The warmer the water gets, the faster its molecules move, and the faster it evaporates. Then we moved on to the second exercise. We had to check if water evaporated faster in a covered or an uncovered cup. Rafia Aunty bought plastic cups for us. These were extremely light and kept flying away. So, we had to fit three cups to make one container. Aneesa Aunty told us we had to make our own scale to measure the water height. We used labels to make the scales. There was a problem that the 0 cm didn’t align with the bottom of the cup — we had to redo some labels. But in some cases, Aunty just pushed the cup in deeper. Then she asked us how we planned to cover one cup. Salman tore off the transparent contact cover from his notebook and secured it around the mouth of the cup with a rubber band. That was innovative. Finally, we went up to the terrace to put out our cups. We’re going to measure the levels each day. The next day we found that some of the cups had been turned over. Maybe the crows, maybe the wind — but we found some cups missing or toppled over the next day. We did have some observations from the cups that remained, but they were odd. 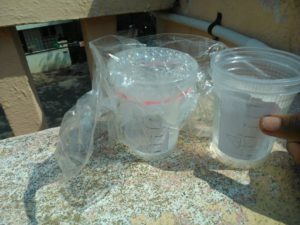 One team saw that the water level in the covered cup had gone down, another saw that the water level in the uncovered cup had gone down. But Aunty asked if we had rechecked that their levels were equal when we started the experiment — we weren’t sure. 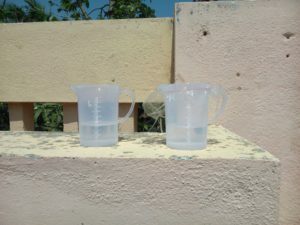 We did also see that the evaporation was less in the cups kept in the shade compared to the cups kept directly in the sun. But again, we weren’t sure of our starting measurements. Also, Safwan pointed out that the measurement stickers were put on the outer cup, but the inner cup which had the water didn’t have its bottom flush with the outer cup. Hence the measurement label was below the actual zero point. So, we tried again. We decided to use soda bottles. We closed one and left one open. We saw there were small water droplets inside the open bottle, but none in the closed bottle. That was not what we expected. We saw that the water level in the closed bottle increased! How could that be? Did we not measure properly the first time? Then someone said that the water vapour in the closed bottle must have condensed and increased the water level. 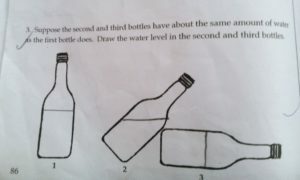 We also noticed that the water level in the uncovered bottle had remained the same. We think that may be because some water evaporated during the day, but then again dew from the air must have fallen into the bottle at night. So, the level became the same. With all the trouble with the labels we finally decided to use beakers with measurements marked on the side. But we forgot to check the next day if the water levels had changed. We are slowly realising that correct measurements are very important in science. Otherwise our observations will be wrong. And that experiments sometimes need to be repeated again and again — because many things can go wrong! Then there are measurement errors — which we don’t even begin to think about at this point. 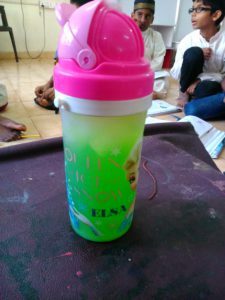 Today we used Afsheen’s bottle of juice for an experiment. Rafia Aunty brought it out of the fridge. It was very cold. We all touched the bottle and found it was dry outside. Suddenly we started noticing droplets of water on bottle. Aunty asked us to touch the droplets and taste them. They tasted like water. They weren’t green either. Aunty asked us to think where the water came from. Safwan felt it had come from the straw on top of the bottle. Abdullah also said that it had evaporated from the top and come to the side. Someone else said it had come through the plastic. But Ameeth was quite clear — the water has condensed from the water vapour in the air. Aunty said he was right. Then Rafia Aunty brought two cups with cold water. One was wrapped with a thick towel and the other was left bare (unwrapped). Aunty asked us to vote, which cup would feel wet outside. Thirteen of us voted that both would be wet. One felt that only the bare cup would be wet and another felt that only the wrapped-up cup only would be wet. When we touched the inside of the towel, we saw it was quite dry. But the cup without a towel was also seemed dry. Rafia Aunty said that these were both plastic cups — we should try the experiment again with metal tumblers. We did that. Again, we found that the towel was dry and so was the tumbler under it — but this time the bare tumbler was quite wet. Teacher’s note: There were nice learning opportunities even in our failed experiment. We found that the double-walled plastic cup was not cold enough on the outside to get water vapour to condense on it. And any small droplets were not visible on the corrugated white surface. After our discussion in the previous experiment with the closed bottle students were reasonably convinced that the water vapour in the air condensed upon touching the bottle. 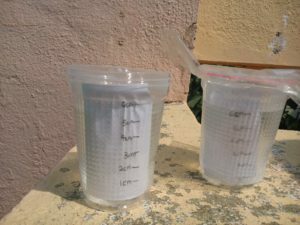 They were able to extrapolate this result to the steel tumbler experiment, to conclude that the towel must have stopped the water vapour in the air from reaching the tumbler. 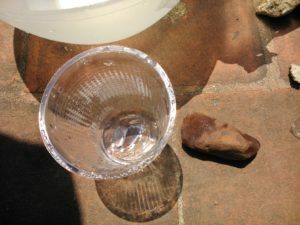 Today we took a baking bowl with some water, inside which placed a plastic glass which had a large stone in it. We covered the bowl tightly with a plastic covering we tore off someone’s notebook. Then we taped the covering. On top of the cover, we placed some small stones. The next morning we went upstairs to see what had happened. Aunty took the stone out of the glass and we saw it was wet. Aunty again made us record our observations on the blackboard. Aahil commented that some water had collected in the plastic glass too. Ishaal guessed that the water in the bowl had evaporated and then condensed again and fallen into the glass. “Like rain”, Ameeth added. The plastic sheet had many drops of water condensed on the inside. 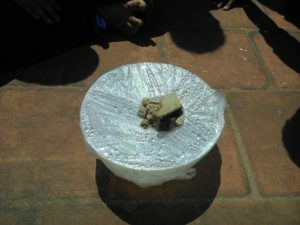 Mariam said that all the water would have remained stuck to the plastic covering, but the stones we put on top had made the covering slope and the water fell into the glass. “Like a mini purifier”, observed Ameeth again. Abdullah K. thought that the evaporation must have happened during the day and the condensation happened at night when it was cooler. Aunty told us that some people in deserts use this way to collect water. Today we brought in an induction stove and boiled water in a pan to see what would happen. First, we saw very small bubbles at the bottom of the pan. Then the number of bubbles and their size started increasing. Suddenly the bubbles started travelling up from the bottom of the pan. Then the top of the water started rolling and boiling. Aunty held a cold plate on top of the pan. We saw the water droplets forming on the bottom of the plate. Aunty asked us where the droplets were coming from. That was easy — from the water vapour rising. Today we laughed and laughed as we heard Aunty tell the story of the water molecule. * We had to imitate her actions and say the funny words. We understood how water condenses and evaporates — it is called the water cycle! Even as we struggled with this problem, we did identify some effective work practices and were occasionally rewarded by some thoughtful responses from students. We were encouraged in the second term when the 3rd and 4th graders improved significantly in their responses, in both oral and written form. Besides the work practices described before we also discovered other good teaching strategies. 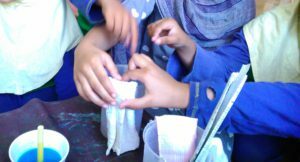 After the activities and experiments we focussed on structuring the children’s observations. They come out with excellent observations — very detailed — as you can see in the recent three posts. Students started using complete sentences to write answers — these were also quite clear in structure. The workbook responses improved dramatically since we started asking them to do the workbook portion related to an activity within the class time. A big change is that we have started devoting a full morning session — about 2:45 hours for a science class — that way we get to do the activity, discussion and workbook work within a single chunk of time. The students used their prior learning about air and water to come to conclusions like, “Water vapour is in the air. When it touches something cold, it condenses.” Or, when wet clothes dry, water “evaporates” and “becomes water vapour”, some of which “goes to the clouds”. 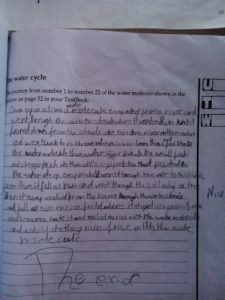 Most children enjoyed the Water Cycle question (journey of a water molecule) even though it required a long response. In the same month we had a story-writing and book-making workshop conducted by the wonderful conservation educator and nature photographer, K. Ramnath Chandrasekhar. This experience inspired one child to develop his story into a lovely book, “Mr. Water molecule on a mission!” Another took it up as a project for Open Day. Here is a link to the book. The book cover is our proudly featured image for this post. And here are some workbook responses. 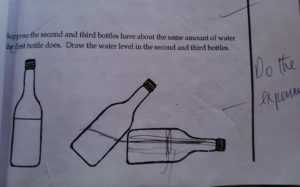 Some children were confused about the water levels in the upright, tilted and horizontal bottles and marked a ‘vertical’ water level in the horizontal bottle. I asked them to do the experiment and check, after which they changed their responses. The water level task was designed by the developmental psychologist Jean Piaget and is now a standard probe of spatial reasoning. In the ‘Talk and write’ section, the children could easily write a para about playing on a rainy day, but most children struggled with the ‘Play with words’ (Do these words describe air, water or both air and water? – splash, blow, flow, drip, run, fall). Possibly the instructions need to be re-worked, to reduce the demands placed by simultaneous processing of different situations and their descriptions. Students are getting better at asking questions — also deeper and more probing. However as usual the ‘Ask a question’ section didn’t get quality responses, with one exception (below). Children rarely document questions as they occur to them. And see this section as a final question in the workbook. We still see only a few children actively participating in the class discussion. We should make special efforts to draw out the shy children. It’s not that the children are tuned out — just that they don’t speak up as often — possibly overwhelmed by the active participants. Two of the silent ones went back and duplicated the experiments, and went on to make a video on it. The children have interesting take-aways — not necessarily ones we “want”. And it’s anyone’s guess how much they absorb, remember and process. For example, we were discussing separation of mixtures before the “water climbing” class started. They suggested that salt could be sieved out of water. I asked them if heat could be used to separate salt and water. They didn’t think so. I asked them to think again. Finally, one of them said, “yes, that’s what we did when we separated the salt from the water.” Some were confused — where did the heat come from, but another readily supplied the answer — from the sun. I wonder if our excitement at seeing the salt / sugar crystals and subsequent discussion diverted them from the learning that a separation process had taken place. The abstract and invisible nature of water vapour is something we teachers may take for granted but for a child it involves a leap of imagination. Thus we feel they have “learnt” something in a class but then they immediately fail to apply it in the next context. 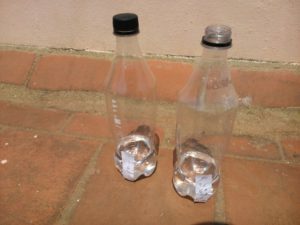 For example, while children had learned that there is water vapour in the air, only one child extended the thinking to guess that the water droplets outside a cold bottle were due to the water vapour condensing on the outside. To take this point further, they don’t always think through their learning to what for us may be a logical conclusion. 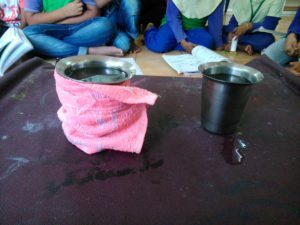 The majority of the class felt that the two glasses with cold water would both be wet outside, despite the fact they saw the towel covering the cold outer surface of the glass thereby preventing water vapour condensing on it. 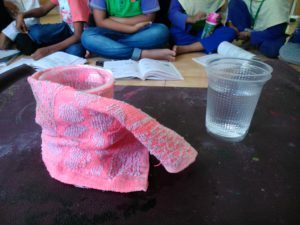 However, in a class taught in a previous year, children had stated that the towel covering the glass would also feel wet because — air is everywhere, it would get through the towel to the surface of the glass, water vapour in this air would condense and make the towel wet. As in any class, storytelling is always a huge success. Children remembered that lesson very well and went on to writing little stories about a water molecule. One of these developed into the beautifully crafted, environmentally sensitive book on “Mr. Water molecule”. 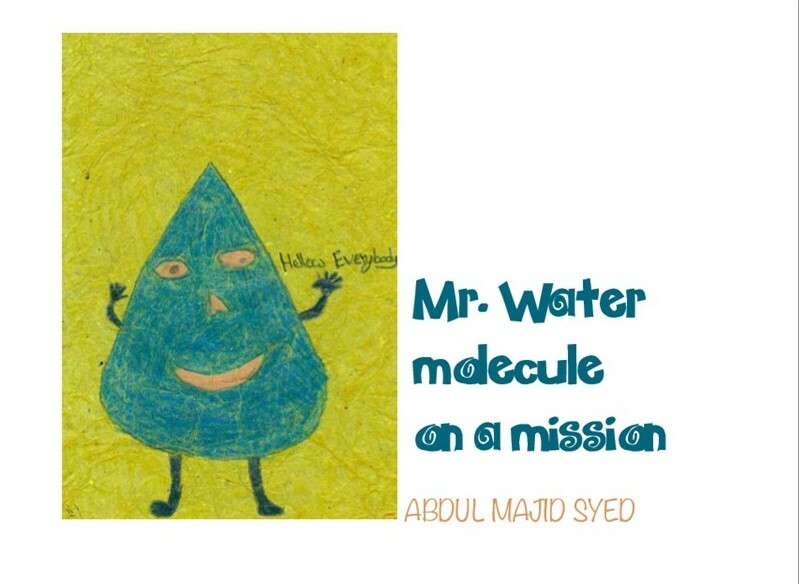 * You may also like the Hindi and Marathi versions of the water cycle story.